On August 27, 1883, the earth hear a very loud voice that has not had never happened again since then. As quoted, At 10:02 local time very loud noise emerged from the island of Krakatoa, located between Java and Sumatra in Indonesia. The voice was 2000 km away on the islands of Andaman and Nicobar; also heard 3200 km away in New Guinea and Western Australia; and even 4800 km away in the Indian Ocean island of Rodrigues near Mauritius. Overall, the sound was heard by people in more than 50 different geographical locations. So what might make a loud sound like that? A new volcano Krakatoa erupted with such force that tore apart the island up, emitting a plume of smoke that reached 27 kilometers into the atmosphere, according to a geologist who witnessed the event. The sound produced by the explosion of Krakatoa mountain running about 2500 km per hour, or about 2 times the speed of sound. This explosion creates a deadly tsunami with waves as high as more than 30 meters. One hundred and sixty-five coastal villages and settlements were swept away and completely destroyed. Dutch colonial government at the time estimated the death toll at 36,417 people, while other estimates exceed 120,000 inhabitants. British ship Norham Castle is 64 km from Krakatoa at the time of the explosion. The ship's captain wrote in his log, "So powerful was the blast that solve the eardrum over half my crew. My final thought is my dear wife. I think the apocalypse has come. " In general, the noise caused by fluctuations in air pressure. A barometer in Batavia gas plant (160 km away from Krakatau) recorded a surge of pressure in excess of 2.5 inches of mercury. Which if converted means more than 172 decibels of sound pressure, sound loud unimaginable. To put it in context, if you operate a machine drill, you will be charged around 100 decibels. The human hearing threshold for pain around 130 decibels, and if you are unfortunate enough, standing next to a jet engine, you will experience the sound of 150 decibels. (Increased 10 decibels are considered by people like sounds about twice as loud). Krakatau explosion recorded 172 decibels at a distance of 160 kilometers from the source. It's very very hard, and this violates the limits of what we mean by "voice." If you are humming or talking though a word, you wiggle the air molecules back and forth dozens or hundreds of times per second, causing the air pressure to be low in some places and high elsewhere. The louder the sound, the more intense this wobble, and the greater the fluctuations in air pressure. But there is a limit to how loud the sound could do wobble. At a certain point, fluctuations in air pressure is so great making a low pressure area reaches zero pressure (vacuum) and you can not get lower than that. This limit occurs at about 194 decibels of sound in Earth's atmosphere. If harder than that, the sound is no longer just passing through the air, but really pushes the air along with it, creating a moving semburang air pressure known as the shock wave. Back to Krakatau, the sound of the explosion exceeds this limit, produce bursts of high-pressure air that is so strong that break the eardrums of the sailors who were 64 km away. When sound is running thousands of kilometers, reaching Australia and the Indian Ocean, the wobble on the pressure starts to weaken, until it just like a shot away. More than 4800 km, the pressure waves grew too small to be heard by the human ear, but kept sweeping and so on, echoed for days around the world. The atmosphere is ringing like a bell, inaudible to us, but is detected by our instruments. At the end of August 1883, weather stations in several cities around the world use the barometer to track changes in atmospheric pressure. Six hours 47 minutes after the explosion of Krakatoa, a surge in air pressure is detected in Calcutta. After 8 hours, the pulse reaches Mauritius in the west and the Melbourne and Sydney in the east. 12 hours later, St. Petersburg recorded beats, followed by Vienna, Rome, Paris, Berlin, and Munich. Time of 18 hours after the explosion, the pulse has reached New York, Washington DC, and Toronto. Remarkably, for 5 days after the explosion, weather stations in 50 cities around the world observed a surge of pressure this unprecedented, re-recorded approximately every 34 hours. That is roughly how long it takes sound to travel around the earth. 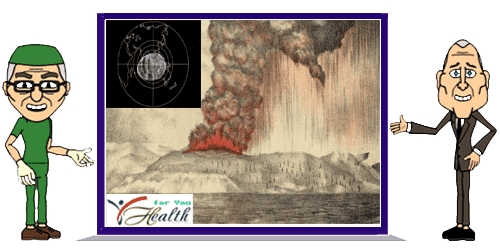 Overall, the pressure wave from Krakatoa around the world three or four times in each direction. Meanwhile, tidal stations as far away as India, UK, and San Francisco noted that the rise in sea waves simultaneously with the air pulse, the effect of which has never been seen before. A voice that can no longer be heard is constantly moving around the world, a phenomenon dubbed the "Great airwaves." More recently, a video tremendous volcanic eruption recorded by a couple who were on holiday in Papua New Guinea began viral on the internet. If you watch it, this video gives you a 'taste' of the pressure wave created by the volcano. When a volcano erupts, producing a sudden surge of air pressure; You can actually see it when the wave moves through the air, the water vapor condensing into clouds as she moves. People who take video thankfully far enough so that the pressure wave takes time to reach them. When the waves finally hit the boat, about 13 seconds after the explosion, you heard what sounded like a loud gunshot accompanied by a sudden burst of air. Multiplying 13 seconds with a speed of sound tells us that the boat was about 4.4 kilometers away from the volcano. It is somewhat similar to what happened at Krakatau, except for the sound of gunfire in the case of Krakatoa could be heard not only 4 kilometer but 4000's of kilometers away, an extraordinary demonstration of the enormous destructive power that can be released by nature.